ACT 1 -- An old gipsy, the mother of Azucena, has been burnt as a witch by the father of the present wicked Count di Luna. Azucena, to revenge her mothers death, steals the Counts younger brother, Manrico, tries to kill him, and, by mistake, kills her own child instead. She therefore brings up Manrico as her own son, and he becomes a wandering minstrel or troubadour, though this sequel is unknown when the opera begins. Leonora, a lady of the Spanish Court, is the object of Manricos affections, and, as fate will have it, of the Counts also. Jealousy, of course, ensues, and there is a challenge and a duel. With the wounding of Manrico the Act ends. ACT 2 -- This takes place at Azucenas gipsy camp. Manrico is there, and from Azucena he now first learns the story of his birth. He cannot believe it. Then a messenger arrives with word that Leonora, supposing him dead, proposes to become a nun. Contention again arises. The rivals -- Manrico and the Count -- meet in the convent; Manricos attendants overcome the Counts, and Manrico bears off Leonora. ACT 3 -- Here we have the Count beseiging Castellor, whither Leonora has fled with Manrico. The lovers were about to be united. But Manrico learns that Azucena, taken for a spy and subsequently recognised as the supposed murderess of the Counts brother, is condemned to be burnt by the Count. Manrico attempts to rescue her, but is himself captured. ACT 4 -- Leonora visits Manrico in prison. She offers to marry the Count as the condition of Manricos release, meaning all the time to take poison in preference to surrendering herself to the Count. Manrico refuses liberty on these terms. The Count sends him to the scaffold, and only after the execution does he learn from Azucena that he has sacrificed his long-lost brother. The music of "Il Trovatore" has been described as often distressingly simple and tawdry; and undoubtedly it does show a falling off from the promise of "Rigoletto." But Mr. Louis Elson, an American writer, has probably best answered this objection by pointing to its direct melodic and dramatic force; a feature which deserves far more praise than some critics are willing to accord to a work of the purely tuneful school that once inspired a thousand barrel organs. After all, "magnificent tunes" are not to be sneered at. Verdis music was meant to please a public wholly childlike in its emotions and impulses, and it achieved, as it still achieves, that purpose. The Counts great bass aria "Il Balen," the bright "Anvil Chorus" of the gipsies, Manricos spirited air "Di Quella Pira," his tender duet with Azucena, the great "Miserere," and the effective prison scene, there are not made of the stuff that is found in Wagner; but, as Mr. Elson says, they are wholly good and appropriate in their own fluent way, and even the classicist must acknowledge their direct melodic charm. A space of nearly two years elapsed between the performance of "Rigoletto and "Il Trovatore," which was first produced in Rome, at the Apollo Theatre, on January 19, 1853. It evoked frenzied excitement. The eagerness of the Roman public to hear it was extraordinary. On the eve of the performance, the Tiber had risen in flood and invaded the whole district near the theatre. But in spite of eveything -- the cold, the mud, and general discomfort -- from nine oclock in the morning the doors of the Apollo were beseiged by a great crowd, who, with their feet in water up to the ankles, squeezed, pushed, and disputed in order to get places for the evening. Such a concourse had never been seen, and when the opera gradually unfolded itself it obtained "an immense and boisterous success, the echoes of which resounded in a short time from one end of Italy to the other." Its spread was, in fact, electrical, not only in Italy but through the whole of Europe. Theatre after theatre produced it, answering the clamour of eager subscribers and patrons. At Naples three houses were giving it at the same time. Seldom was an opera more fortunate. 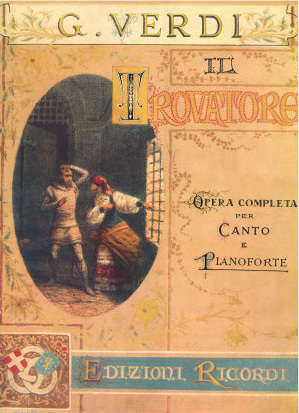 Il Trovatore by G. Verdi. Poster circa 1923. Size: 18 in x 24 in.